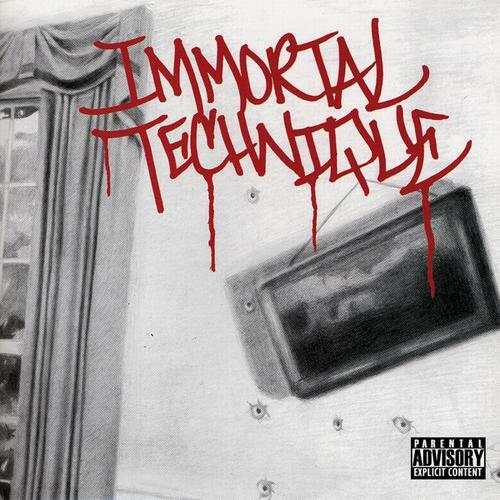 The revolutionary stance of Immortal Technique is set from the very start on his 2003 album, Revolutionary Vol. 2, as it begins with an introduction form Mumia Abu-Jamal. From there, Immortal uses his music to discuss history, the international drug trade, politics, institutional racism, terrorism, capitalism, the music industry, the media and religion. With Revolutionary Vol. 2, Immortal Technique points out contradictions embedded in American political rhetoric, and comes down hard on the Bush Administration. Given the year this album was released, there is much we can learn about the tumultuous years that followed the attacks on the World Trade Center. Beyond that, it becomes clear that there are still gross inequities and oppression that exist, not just in the United States, but also across the globe. With Revolutionary Vol. 2, Immortal Technique forces the listener to reflect on these global problems that have an impact on our lives. This is evident on the third track, “Peruvian Cocaine.” With help from Pumpkinhead, Diabolic, Tonedeff, Poison Pen, Loucipher and C-Rayz Walz the complexities of the international drug trade are revealed. Immortal Technique begins rapping from the perspective of an exploited field worker who harvests the coca plant because there is no other source of income. “I’m on the border of Bolivia, working for pennies / Treated like a slave, the coca fields have to be ready” and later, “Dreaming about revolution, looking at my machete / But the workload is too heavy to rise up in arms.” From there we hear from Pumpkinhead, rapping from the perspective of the South American drug lords that have the financial influence to pay off the police. “I got the power to shoot a copper, and not get charged /And it would be sad to see your family in front of a firing squad.” From there, each MC provides a different perspective from the various individuals involved in the complicated cocaine industry that oppresses, kills and makes people rich. As Immortal Technique explains at the end of the song, “The story just told is an example of the path that drugs take on their way to every neighborhood, in every state of this country. It’s a lot deeper than the niggas on your block.” I can hear Clarke Peter’s character from The Wire, Lester Freamon, advising McNulty to follow the money. Following “Peruvian Cocaine,” Immortal Technique transitions from talking about the international business of the drug trade to the people of Harlem, New York. On “Harlem Streets” he reveals a neighborhood that is demoralized and struggling. As Immortal Technique laments, the citizens of Harlem are not to blame for this unfortunate situation, but rather the long history of racial subjugation in the United States. This song is an example of hip-hop being used to give voice to an under-represented community that is not taken into account in the predominantly Euro-American culture of the United States. After “Harlem Streets” comes “Obnoxious,” “The Message & The Money,” “Industrial Revolution” and “Crossing The Boundary” where Immortal Technique demonstrates his abilities as an MC in all of his political incorrectness and reveals the exploitative nature of the music industry. Up to this point, Revolutionary Vol. 2 is up close and personal, providing crucial social, political and economic analysis. On “The 4th Branch,” the content of this album is taken to the next level. With this track, Immortal Technique calls into question the narrative of the media based on the history of foreign and domestic policies of the United States. As he points out in the first verse, “Indigenous holocaust and the home of the slaves / Corporate America, dancin’ offbeat to the rhythm / You really think this country never sponsored terrorism? / Human rights violations, we continue the saga / El Salvador and the contras in Nicaragua.” And then in the second verse, “Embedded correspondents don’t tell the source of the tension /And they refuse to mention, European intervention /Or the massacres in Jenin, the innocent screams / U.S. manufactured missiles, and M-16’s.” Immortal Technique is revealing the highly contested history and imperialist ideology that is not a part of the history we learn. The dominant narrative is about the valiant, Euro-American triumphs. As Immortal Technique makes clear, these “triumphs” have been at the expense of Native Americans, African-Americans, Latinos, the Chinese, poor whites, women and Arabs. It becomes essential to seek out alternate versions of our history. This way it is possible to have a more accurate understanding of the past. On Revolutionary Vol. 2, Immortal Technique uses hip-hop to challenge the institutions of oppression within the walls of our world. He presents a different version of history and image of the world we live in. In doing this, he makes it possible not to depend on only one narrative and encourages people to seek out multiple sources and versions of history, and current events. When people have a more complete understanding of history from multiple sources, it truly becomes possible to work for a better future. Ultimately, Immortal Technique’s music is more than revolutionary, it is educational.